Author(s): S. Sugunakala, S. Selvaraj. Department of Bioinformatics, School of Life Sciences, Bharathidasan University, Tiruchirappalli-620 024, Tamilnadu, India. Background: Epidermal Growth Factor Receptor tyrosine kinase (EGFR) is an important anticancer drug target. Series of pyridopyrimidine analogs have been reported as EGFR inhibitors and they inhibit by binding to the ATP binding pocket of the tyrosine kinase domain. Objective: To identify key properties of pyridopyrimidine analogs involved in the inhibition of the EGFR protein tyrosine kinase by developing 2D QSAR model. Methods: Variable selection was performed by least absolute shrinkage and selection operator (LASSO) method and multiple linear regression (MLR) method was applied by using Build QSAR software to develop QSAR model. Model validation was done by Leave One Out method (LOO). Further, based on the bioactive and structural similarity, virtual screening was performed using Pubchem database. 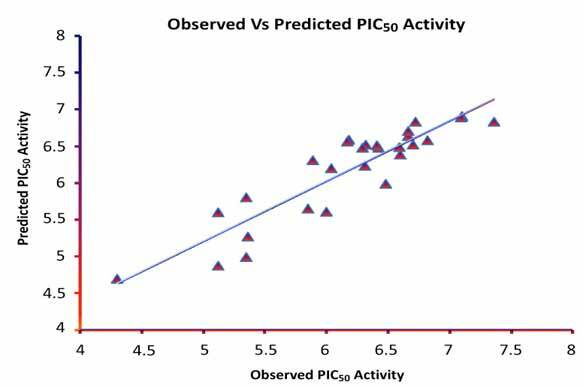 Using the developed QSAR model and Molinspiration server, PIC50 values and kinase inhibition activity were predicted for all the virtually screened compounds respectively. Results: The best QSAR model consists of two descriptors namely Basak and MOE type descriptors, and has R2 = 0.8205, F= 57.129 & S = 0.308 and the validation results show significant statistics of R2cv = 0.655, Average standard deviation = 0.416. 140 compounds were obtained from virtual screening and the predicted PIC50 of all these compounds are in the range of 4.73 – 6.78. All the compounds produce positive scores which suggest that the compounds may have good kinase inhibitory profile. Conclusion: This developed model may be useful to predict EGFR inhibition activity (PIC50) for the newly synthesized pyridopyrimidines analogs. Keywords: Build QSAR, EGFR inhibitors, Electro topological-state index properties, IC50, PyridoPyrimidine analogs, QSAR model, Virtual screening. Affiliation:Department of Bioinformatics, School of Life Sciences, Bharathidasan University, Tiruchirappalli-620 024, Tamilnadu, India. Keywords:Build QSAR, EGFR inhibitors, Electro topological-state index properties, IC50, PyridoPyrimidine analogs, QSAR model, Virtual screening. Abstract:Background: Epidermal Growth Factor Receptor tyrosine kinase (EGFR) is an important anticancer drug target. Series of pyridopyrimidine analogs have been reported as EGFR inhibitors and they inhibit by binding to the ATP binding pocket of the tyrosine kinase domain.